Note to self: don't leave an open package of gummy bears on the seat of your car on a hot day. It turns out that's not such a good idea. 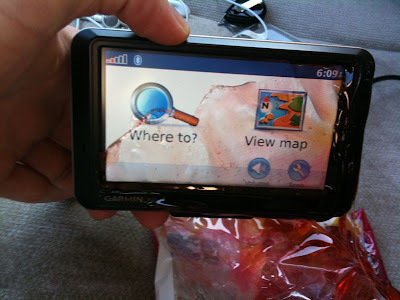 On the other hand,...You have the most delicious gps system in town. Oh man, Bruce! 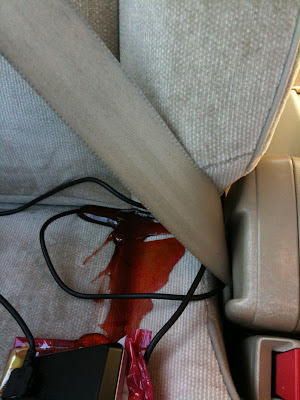 I pulled up your blog and just glanced at the picture (without seeing the name of the post) and totally thought it was blood! ha ha ha whew! I was a little worried until I saw the word, "gummy bears." I sort of agree with evans. You can use your tongue to navigate now. Guess it is time for a new car! No more gummy bears for your birthday! OH NO!! I like shanna's comment. It's ruined now, guess you have to buy a new one- It's the American way!